The Presencing approach of Otto Scharmer is the model I use mostly in the background to design workshops and change processes. Trained in 2004, it has inspired me to invite my clients to look behind the scenes and explore the necessary depth needed to achieve the goals. “Presencing,” a blend of the words “presence” and “sensing,” refers to the ability to sense and bring into the present one’s highest future potential—as an individual and as a group. Theory U offers both a new theoretical perspective and a practical social technology. As a theoretical perspective, Theory U suggests that the way in which we attend to a situation determines how a situation unfolds. As a practical social technology, Theory U offers a set of principles and practices for collectively creating the future that wants to emerge. The Presencing approach is as well called Theory U as the visual model has the shape of a U. 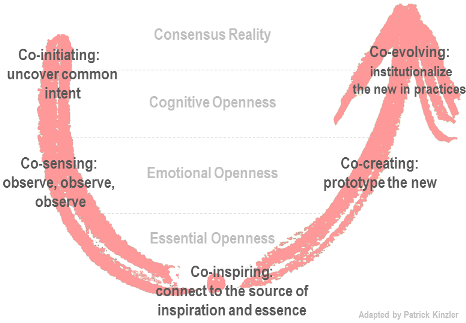 Depending on the task the U can go as deep as to the essential openness (e.g. if a long lasting powerful company vision and purpose has to be defined) or can stay shallow on the cognitive openness level (e.g. if a successful procedure has to be tweaked here and there). If issues and task can not be solved after several attempts on one level, they need to be addressed on another level.